JAY: —in the textile industries. Now let’s talk about the issue of starvation and food. Talk about what’s happening now in terms of—are people getting aid in terms of food supplies? Are people eating or starving? 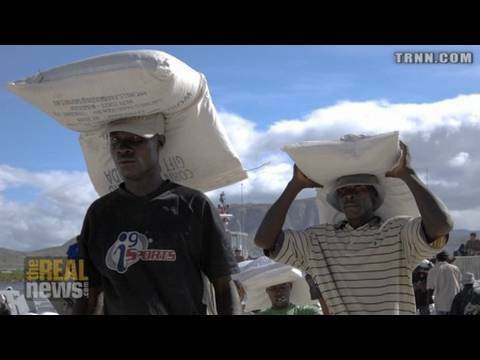 And what’s the future in terms of Haitians being able to feed themselves? DOMINIQUE: The future is very complicated, very complicated. JAY: Talk about where we are now. Are people surviving? Is aid getting to people now? DOMINIQUE: More or less, let’s say. At the beginning, no, so there was a very tight, very difficult situation. And after that there was a second moment where the aid came from the NGOs—Care, PAM [World Food Programme], Oxfam, and so on. And it reached the people a little bit, but with heavy problems, even though. But after that, the Haitian government had a relationship with the government of the south, UNASUR—Lula, Correa, Lugo, and so on of the South American—who passed by the government, not by NGOs. So the situation released a little bit more. But now there are problems again, because this aid is part of the one step more of the destruction of the local production, of the local economy, because when you give a lot of rice, for instance, or anything, rice, you destroy the price of the local rice. And that’s what they did before the earthquake, because this is a whole plan, to have what in Haiti is an enormous situation, but because we have in the cities, in the main cities, 70 percent of unemployment—in countries like the United States, France, Germany, and so on, developing countries in terms of capitalism, 3 or 4 percent is more or less, 5, 6 percent is too much. Twelve, for instance, percent of unemployment in Brazil or Argentina are very high. JAY: And you’re saying 70 percent? JAY: Now, now or before the earthquake? DOMINIQUE: Now, now or before the earthquake. It’s more or less the same situation. DOMINIQUE: Yeah, yeah, yeah. No, no. It’s more or less the same situation. DOMINIQUE: Less computer. Nothing. Now you make a shirt like you made a shirt in the 12th century, more or less—electricity a little bit more, but by hand, exactly, or pen. Okay. And this—. DOMINIQUE: No, no, nothing like automobile or like Coca-Cola. JAY: So it’s more profitable just to find extremely cheap labor. DOMINIQUE: Exactly. The logic is to find cheap labor. And the ’60s, the ’70s, and at the end the ’80s, it was [inaudible] organized. And in the Reagan presidency, they have here in the United States a document, very important document, CBI, Caribbean Basin Initiative, saying that Cuba, except Cuba [inaudible] control too much, they were going to transform this area, the Caribbean, into a source of cheap labor. DOMINIQUE: For textiles, and began the destruction of our local economy. Haiti, for instance, was exporting sugar, one of the respectable exporters of sugar. Now Haiti import 100 percent of sugar. We don’t have, anymore, production of sugar in Haiti. The multinationals came, buy the ingenios of sugar, where you make the sugar, and close them. Now all of them are closed. We import 100 percent of sugar. The same thing with the rice, the ["Miami"] jumbo rice, ["lurky"] rice, charcoal rice, and so on. They made a dumping in the late ’80s, 1990s, and dumping completely. And the rice—. JAY: Which means flooding the Haitian market with cheap rice. DOMINIQUE: Exactly, with cheap rice. And after that—. JAY: Drive out the local production. DOMINIQUE: But the price high again. JAY: And force people from growing rice into textile factories. DOMINIQUE: Exactly. The migration and unemployment, and now the cheapest labor in Haiti. JAY: So once the earthquake takes place, there’s kind of an opportunity to re-create Haiti and not go back to this. But in fact that’s not what’s happening, is it? DOMINIQUE: Yeah, the [inaudible] continues. In fact, Mr. Clinton before the earthquake, in that plan, which is written to have the labor here unemployed, came up with 150 investors—150. It’s a big, big, big deal, because you cannot say, "Come to Haiti tomorrow." It’s work to have 150 people coming to Haiti. And they were going to invest in free trade zone. And after the earthquake, Mr. Clinton came again, with Mr. Bush at the same time, saying that is the same plan than before the earthquake. So this is not a national production in Haiti going on. [inaudible] of the free trade zone, which is against the national production. They are not parallel. One have to destroy the other to have the cheapest labor. JAY: Once you have the earthquake, it seems so obvious that all the investment should be into developing an agriculture so people can feed themselves and not be dependent on aid. DOMINIQUE: Exactly. [inaudible] to have autonomy of—. JAY: But that’s not what’s happening. DOMINIQUE: No. To the contrary, first we have the migration and the cheapest labor. Second, we have to buy food from the United States, and we are totally dependent now from the food of the United States. And the aid destroyed more, even more. And we have the cheapest labor to work for the multinationals—GAP, Wrangler, and so on—of textile. So the situation is completely, you know, like that. JAY: Okay. In the next segment of our interview, let’s talk about the political response of the people. Are they going to live with this? Or are we going to see some demands? Please join us for the next segment of our interview on The Real News Network.